New clues to how the bacteria associated with citrus greening infect the only insect that carries them could lead to a way to block the microbes' spread from tree to tree, according to a study in Infection and Immunity by scientists at Boyce Thompson Institute (BTI) and the Agricultural Research Service (ARS). These symptoms are associated with a bacterium called 'Candidatus Liberibacter asiaticus,' referred to as CLas for short, which is spread from tree to tree by its tiny insect vector, the Asian citrus psyllid (Diaphorina citri). Today, citrus greening has been detected in every citrus-producing county in Florida, throughout the southern citrus growing states and in isolated spots of southern California. Growers have tried many strategies to combat the disease, but none have been effective enough or long-lasting. "Research has shown over and over that nymphs are able to acquire the bacteria from the plant much better than adults," said Marina Mann, BTI researcher and first-author on the study. "Answering why is one of our next steps because it may give us a way to control the psyllid's ability to spread the bacteria." To effectively be spread by psyllids, CLas must pass through the cells lining the insect's gut. The lab, under the direction of BTI professor and ARS researcher Michelle Heck, has previously shown that the gut cells of adult ACP experience a severe stress response when infected by CLas. The cell nuclei become fragmented, and some cells will even undergo apoptosis - auto-induced cell suicide. In their recent publication, the researchers report a much different response in the young psyllid nymphs. "When we looked at nymphs, we found that their nuclei rarely reached the same level of disruption we saw in adults, and thus appeared resistant to the effects of exposure to CLas," said Mann. Many insects are hosts for Wolbachia, and often depend on these bacteria for important benefits - much like how human health depends on gut bacteria. 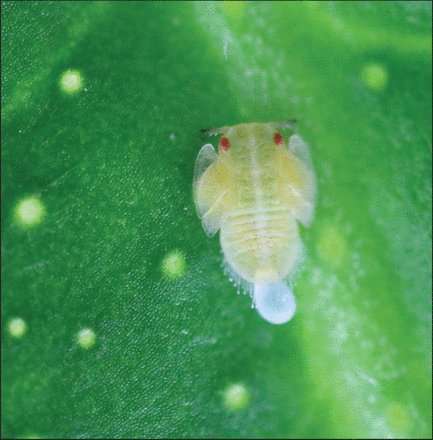 In their study, Mann and Heck show that in psyllid nymphs, Wolbachia and CLas reside within the same cells. To accommodate the beneficial bacteria, the nymph gut cells may actively avoid cell suicide, which, the authors hypothesize, might help CLas get in and multiply at the same time. "We now have a foothold in our understanding of a molecular difference between nymph and adult psyllids in their guts, which CLas exploits to gain entry into the insect vector," said Heck, who is lead investigator for the project. "This is important to our ability to develop new ways to block transmission by insects in the grove." "Citrus growers will be in a much better situation in terms of disease control and saving the U.S. citrus industry," said Dan Dreyer, Chairman of the California Citrus Research Board, which funds this and other research aimed at developing a management strategy for citrus greening. "There are still many unanswered questions about CLas, how it is acquired and transmitted via the Asian citrus psyllid and how it causes the disease," continued Dreyer. "The more we learn about CLas and its vector, the closer we will get to moving citrus production past the threat of citrus greening."